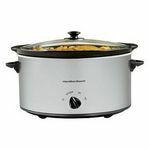 I use this reliable crock pot at least 3 times a week. Great for a mom on the go . Seriously love this product! I was very hesitant at first because I have never really used a crockpot. I googled several recipes and decide to just go for it. First meal I made was a pot roast and it turned out perfect. Very tender and juicy. We ate the whole thing. Highly recommend! I love the size of my slow cooker.....It easily fits everything I cook it in to roasts...sauces...even making cakes in it. 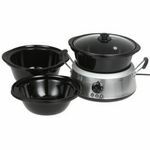 It is so easy to operate and cooks the food well. I can put a turkey breast in there and set it and forget it. Everything is moist and wonderful when it is done. The convenience of cleaning it is another wonderful feature. I have zero complaints about this slow cooker. It's easy to use, clean and store. The lid comes right off and the pot comes right out for simple cleaning. If you're the kind of person who likes to throw something in a cooker and forgetting about it till later, this is definitely for you. 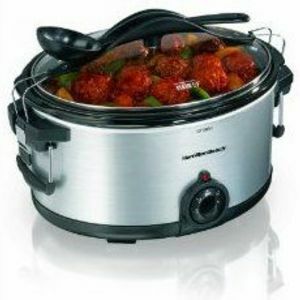 I love this crock pot so much! This is my second one. My first one got left behind when we moved, so had to buy another. It is well worth it! Great for tight budgets and can make just about anything! 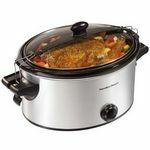 I do wish I had gotten a larger capacity crockpot that would better allow me to put veggies around my chicken, but as i chose the smaller one I can fit the chicken and a lesser amount of veggies. But more than enough for my small family! Super easy to use and simple to clean. I make a wonderfully tasty pineapple upside down cake in this crockpot that my kids love! Very much recommended! 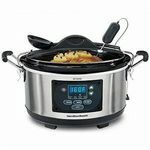 I really love my Hamilton Beach slow cooker. I cannot live without it. I make dinner in a crockpot Two to three times per week. It is easy to use and simple, not to mention the food tastes great. Most recently, It came in very handy over this past holiday season. I was able to reheat items I had previously cooked, and frozen. It made it quick and simple to serve to my holiday guests. I served chili one night and a roast another night. It cooked evenly and effectively. It also has a nice, sleek design and it looks good on my counter top. I like the silver and black colors, because it matches my appliances. 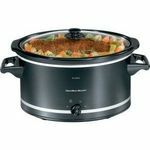 I would recommend this slow cooker to other shoppers and would buy it again in the future. I love my slow cooker! It is so easy to prep dinner in the mornings and have it be all finished at the end of the day. It is really easy to clean and the controls are really easy to use.